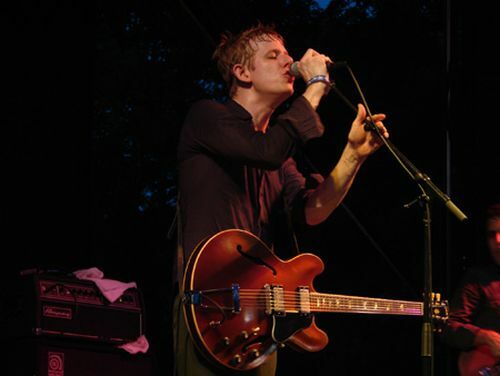 Spoon is rock and roll for the drunken minimalist. It’s pure driving rock, but with clean, tight arrangements — extravagant, but neat — and little of that superfluous Austin sound — fuzzy amp, missed chord, off key. The only frill allowed might be Britt Daniel’s vocal range, veering, at times, from his standard throaty tones to deliver crisp high pitches and breezy whispers, seemingly in the same breath. That’s the impression left by Spoon through my speakers. Live Spoon is rock and roll for the drunken minimalist, one who is getting progressively drunker until she’s stumbling nine-eyed. That’s the impression left by Tuesday’s show. A slow start featured studio quality tracks that were almost too neat and ended too abruptly for a live show. But as quickly as the first three songs closed, the next three gathered steam, and so on. Until the black-clad crew had unbuttoned their shirts, throwing feng shui to the wind. Representing a diverse cross-section of their catalog, Spoon avoided the marketing cow of one-disc-only shows born of LP releases, where the oldest lyric uttered is younger than my beard (two songs from Telephono even made an appearance). Elements of funk were clearly discernible with obvious punk and post-punk overtones (a nod to anti-disco Britain). And I even believe I caught a little honky tonk wail in there, as well as the fat rolling strings of beachy ’60s licks. By the end of the show, mild tunes like “Anything You Want” slammed off the stage with more heart-pounding energy than any song preceding. In fact, if not for lighting changes and lyrics, I might not have known the encore was four separate songs, as organ tones and guitar riffs melted together. And then it stopped.